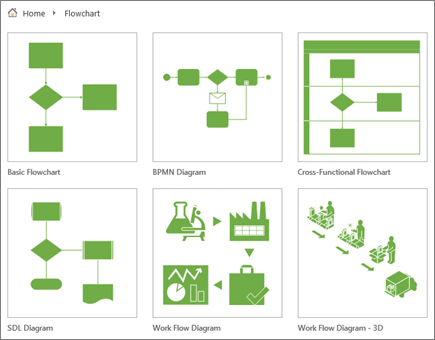 Quickly create professional flow charts, timelines, process maps, organizational charts, IT architecture diagrams, floor plans, and more. Keep diagram data points current by connecting diagram elements directly to data sources. Use data graphics to simplify and enhance the visualization of complex information. 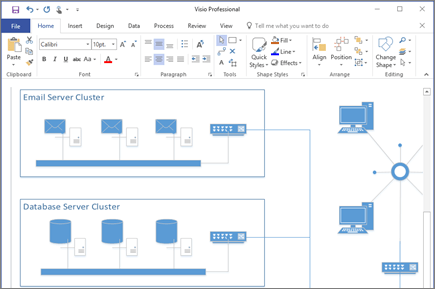 View and share the most up-to-date Visio diagrams from nearly anywhere with Visio Online. View and interact with diagrams on the go with Visio Viewer for iOS. 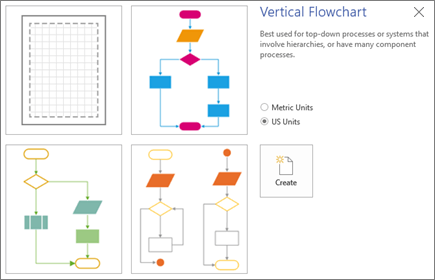 Visio offers more than 75 types of templates. If you're already in Visio, select File > New. Select a FEATURED template, or a template from one of the other categories. Search for online templates or select one of the Suggested searches. Note: The Software, Engineering and Database categories are only available in Visio 2016 Professional and Visio Pro for Office 365. Select the units of measurement, if prompted.